It should be no surprise that Ukrainian democracy guerillas looking to drift their country closer to Europe would want to tap into the well-established nexus of western-funded and native-organized revolutionary movements. Initially links between Otpor vets and a first wave of Ukrainian activists were established in 2003. Just as Kmara picked up the methods and logo of Otpor in Belgrade in 2003, eighteen young Ukrainians made their own pilgrimage to that same Mecca of revolution in the spring of 2004. They met with Otpor leaders at a seminar in Novi Sad before returning home to put the valuable lessons to use. Pora! Logo as pictured on their flag – note the absence of a fist. There were actually two wings formed, Yellow Pora and Black Pora, with divided responsibilities. The yellow wing focused on candidates and political-level work, essentially a constituent party within the emerging “Freedom of Choice” coalition. Black Pora made its first public moves in early 2004, posting fliers across the country in March calling on Ukrainians to remove “Kuchma-ism” from their minds. It was the kids of the black wing who linked up with Otpor in 2003, and it was they who more closely mimicked Otpor, keeping the decentralized structure, and focusing on branding activism and mobilizing the street protests. While Pora drew great inspiration from Otpor, they chose not to directly mimic their iconography as Kmara had in Georgia. The Ukrainian activists instead developed their own images; their equivalent of the clenched fist was a ticking clock set at 11:45, incorporated as the “O” in the Cyrillic rendition of P-O-R-A. And they made excellent use of graphics, from the “Orange Sunrise” pyramid to ones with more aggressive imagery such as a giant boot crushing a cockroach. These were repeated ad infinitum on mass-produced t-shirts, posters, pamphlets, bumper stickers, etc. Pora started to work “weeding out” corrupt officials; who was a weed and who a flower was sorted out by blacklists, compiled by both yellow and black wings. Yanukovych's Regions party cited these lists as reason enough for the Security Service to ban Pora as terrorists seeking another popular coup as had occurred in Georgia. Indeed, Liberty Institute’s Givi Targamadze, along with several other Georgian parliamentarians visited Kiev and shared their knowledge and experience of civil disobedience with the newly created Pora. Targamadze allegedly used a televised interview in Ukraine to give activists specific instructions about things such as seizing strategically important buildings. Kmara delegates were also allegedly involved in this trip, and Pora sent its own representatives to Tbilisi to learn more from Kmara members on their own turf. 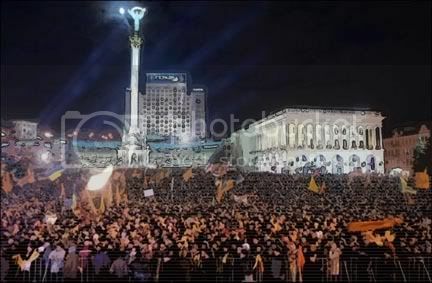 Well-advised and eventually numbering in excess of 10,000 members, Pora used civil disobedience and Otpor-Kmara-style street theater tactics to agitate against Kuchma’s regime in Kiev and elsewhere. Ian Traynor noted “their websites and stickers, their pranks and slogans aimed at banishing widespread fear of a corrupt regime.” Pora member Alina Shpak explained their approach; “we mocked the power as much as possible. You can't be afraid of someone you're laughing at.”  So they weren’t afraid of Kuchma’s designated successor, who was laughed at widely for the “egg incident;” on a September 24 visit to western Ukraine (Ivano-Frankivsk), an opposition activist threw an egg at Yanukovych in public. BBC News explained the victim “collapsed to the ground, groaning and clutching his chest. Initially hospitalised in intensive care, he recovered within hours and went on television to say he felt sorry for the ‘wayward’ youngster who had thrown the egg.”  Pora-types noted the loser-like behavior and took heart. Not everyone was so daring, and as in Serbia, the young activists organized harmless, humorous street happenings. For example Pora dumped a mound of pumpkins in a Kiev street in a “Pumpkins for Yanukovych” action. This had the benefit of keeping to the orange color scheme decided on for the revolution, chosen for its cheerful vibrancy and its discernability from the traditional Ukrainian colors blue and yellow – taking the yellow and shifting it to orange, directly chromatically opposed to blue, the color of the governing party. But the main thing about pumpkins in Ukraine, and the point of the action, is the rural custom of a girl rejecting an inferior suitor by handing him one. It was an inderect, culturally appropriate, and pointed way of telling Kuchma he was out - the people had accepted a different husband. , , , . Kuzio, Taras. "Pora! takes two different paths." Eurasia DailyMonitor. February 2 2005.